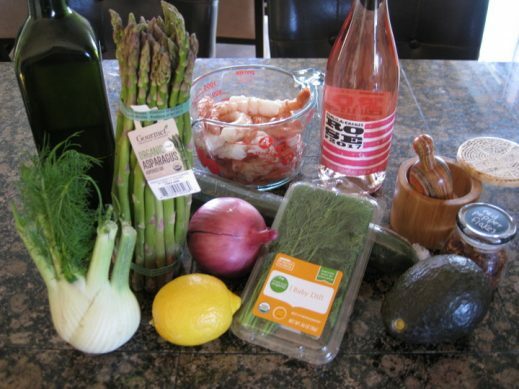 This quick Gluten Free and Low Carb Poached Shrimp Avocado Salad is loaded with Spring Vegetables and a Citrus Dressing. Set aside 6 to 8 sprigs of fresh dill for poaching liquid and roughly chop remaining dill. Measure 1/3 cup (packed) and set aside. Cut lemon in half, reserve 1/2 for dressing and set 1/2 aside for poaching liquid. Peel red onion and slice in half. Reserve 1/2 for poaching liquid and quarter and very thinly slice remaining half. Set aside. Cut off the fennel fronds (greens) and set aside for poaching liquid. Trim bottom of fennel bulb. Quarter fennel and thinly slice. Grab a 3-Quart pot and add 6 to 8 sprigs of fresh dill, 1/2 lemon, 1/2 red onion, the greens from the fennel, 1 tsp kosher salt, 8 whole black peppercorns and a pinch of crushed red pepper flakes. Cover with cold water until the pot is about 3/4 full. While water is coming to a boil, prep the shrimp by removing the shells (leaving the tails on is optional) and using a paring knife to remove the top vein. Once poaching liquid comes to a boil, carefully add shrimp. Poach for 2 to 3 minutes or until shrimp are in a perfect "C" shape. Test and quickly remove to a strainer and set aside. Dump poaching liquid and refill pot with cold water and a pinch of salt. Set on stove-top and bring to a boil (for asparagus). While water is coming to a boil, trim ends of asparagus and cut on the diagonal into 1" pieces. Add asparagus pieces to boiling water and cook for 1 minute. Immediately drain and run under very cold water. Combine 1 T of lemon juice (from remaining lemon half), 2 T extra virgin olive oil, 1/4 teaspoon kosher salt and a pinch of crushed red pepper flakes in a small bowl or jar. Whisk or shake until well mixed and set aside. Wash cucumber and slice in half. Slice into 1/8" half moons and set aside. Cut avocado in half, remove pit and carefully peel away the skin. Cut each half into 1/2" chunks. Combine all ingredients except shrimp in a large mixing bowl. Add dressing and gently toss to coat. Divide into 2 servings (for dinner) or 4 servings (for appetizer) and top with shrimp. Serve within 1 hour and Enjoy!